SUVs are true "do it all" champions. They're equally at home amongst the labyrinth of city streets, the twists and turns of the backroads, and off the beaten path. Are you looking for a vehicle that will take your everyday adventures to new heights and leave "that's impossible" in the rearview mirror? If so, choose the breathtaking power, unparalleled luxury, and stunning performance of the Audi Q7. 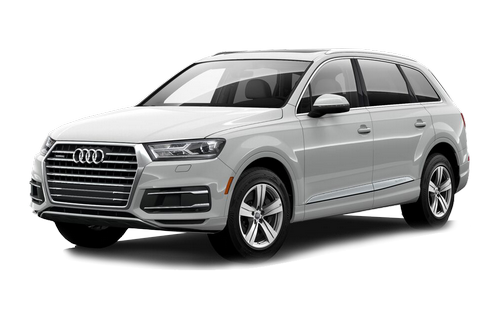 To find your Audi Q7 near Langley, visit the auto group that's as remarkable as the vehicles we sell. Welcome to the Gold Key Auto Group. At Gold Key, we're proud to maintain a stunning selection of new and pre-owned Audi Q7 models, each equipped for exploration. Our expert sales team members will go through your list of must-haves, and match you with the SUV that's got everything you're looking for - and much more! We've got over 30 years of satisfying customers just like you, and we look forward to showing you just how easy, convenient, and fun shopping for an Audi Q7 near Langley can be! Visit us today at 19545 Langley Bypass in Surrey, BC, or give us a call at 888-903-7414. Your next great adventure awaits. From sales to service, our staff goes above and beyond for your next Audi Q7 purchase. Visit us near Langley today! We offer state of the art showrooms and service centers. If you're looking for an SUV that inspires confidence with every glance, then feast your eyes on the Audi Q7. Rugged styling, precisely sculpted lines, and an unmistakable road presence make the Q7 a true standout among its parking lot peers. Standard 19-inch wheels bring the Q7's signature style right down to the ground. Want a distinctive edge? Choose the optional Black Optics package to give the rear diffuser, window surrounds, roof bars, and grille a dark-as-night hue. Don't just turn heads. Cause people to stop and stare. A truly capable SUV needs a truly capable powerhouse at its core. Lurking within the depths of the Q7, a 2.0L TFSI engine spins out an impressive 252 horsepower. Want even more "get up and go"? Choose the supercharged V6 for a breathtaking 333 horsepower. With great power comes great responsibility, and you can count on the eight-speed Tiptronic transmission to deliver a thrilling ride every time. An available air suspension provides sophisticated handling, even on the tough terrain. Get it all, in the Audi Q7. Ready for adventure? The interior of the Audi Q7 feels as big as all outdoors. Spacious seating for up to seven lets you bring the whole crew along for the ride. When you choose the optional Luxury package, the driver and front passenger will travel in ultimate comfort, thanks to individually-contoured seats that offer heating, ventilation, and massage options. Carrying a lot of cargo? With the seats folded flat, you'll enjoy a whopping 2,075 litres of storage space. Go ahead, bring it all with you in the Audi Q7. The Audi Q7 is a master of effortless safety. Stay completely aware of your surroundings and keep your eyes on the road with the optional head-up display that clearly projects essential data like speed and navigation. Take the guesswork out of safely navigating a traffic jam with available adaptive cruise control. This innovative system not only adapts your speed to maintain a safe distance between you and the vehicle in front, it can also bring you to a complete stop and then resume your pre-set speed once traffic starts moving again. Drive with confidence in the Audi Q7.